Liane posing for a sphere image of a feral cat. 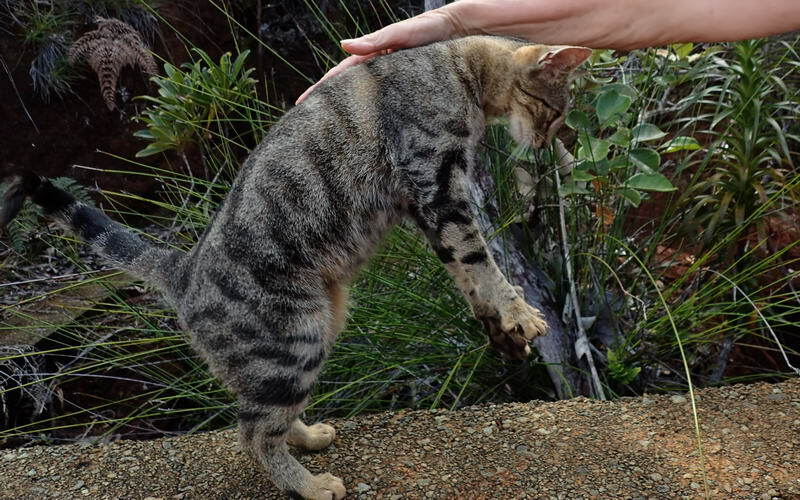 We first saw the kitten when we were taking a shower in a spring that empties into the Carenage River in the Bay du Prony on the southern tip of Grande Terre. It was just a tiny little face peering at us through some grass. I caught a glimpse of the mother cat under a nearby tree and as soon as I glanced at her she was gone. 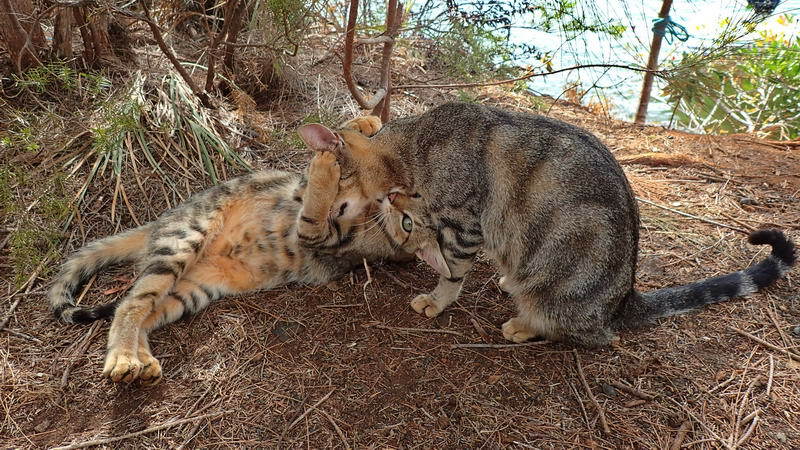 The kitten was, like it's mom, perfectly camouflaged, almost invisible. If it had not moved I never would have seen it. A few months later, in October 2016, the kitten appeared on the trail near where we bring our dinghy ashore. It was very small and scrawny - apparently starving. The only thing I had to offer it was some dried-fruit balls made of raisins, apricots, nuts, and cranberries. It gobbled them up. 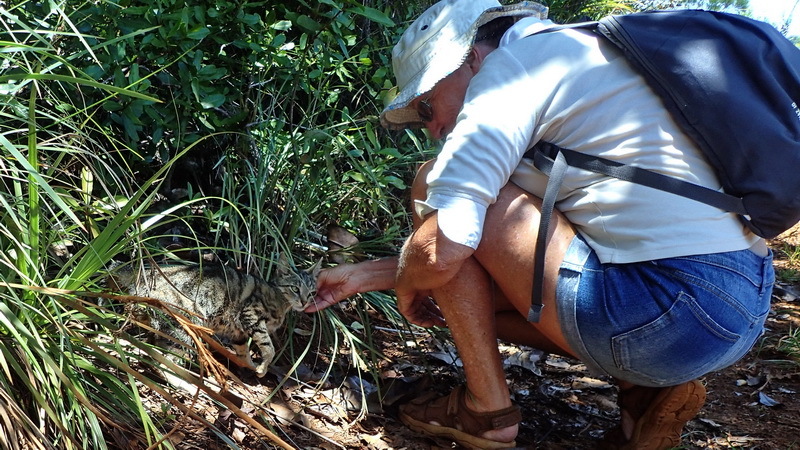 Next time we came ashore we arrived with some canned sardines and some ground beef and we set up a little feeding station on the path where we first saw the kitten. For the first few days we didn't see the kitten, it was too frightened, but the food vanished. One morning, the kitten showed up and before it attacked the food it came over to us and thanked us, purring, rubbing against us, and THEN going to the bowl to chow-down. Pretty amazing. It thanked us first. After a few more days the kitten would be waiting for us, run to us and thank us for bringing food and then wolf it down. 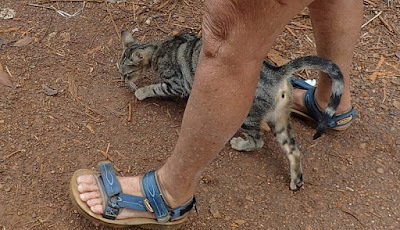 Our next surprise was when we set off for our morning walk and the kitten was right there, between out feet. It walked right in front of our feet, cutting us off, maybe trying to get us to stay for awhile. It was really cute. Soon the kitten began going along on our walks, sometimes out front, sometimes walking behind, sometimes doing her foot-dodge trick. 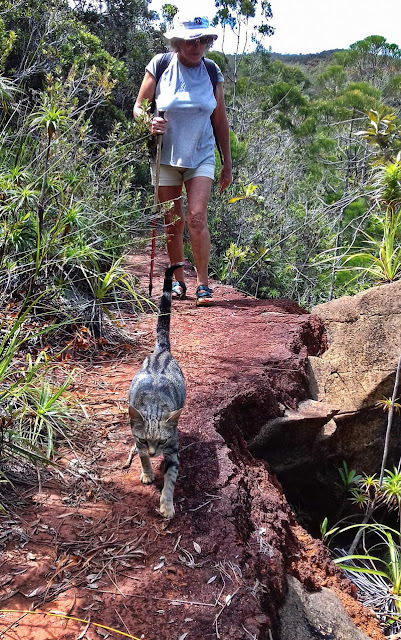 We had never heard of a cat going for walks with people - except of course for people who bring cats on walks using a leash or carrying them. We named the kitten Liane. She walked with us every day with her strangely kinked, scrawny tail held high. By March of 2017 Liane had filled out and the scrawny kinked tail was straight and fully formed. 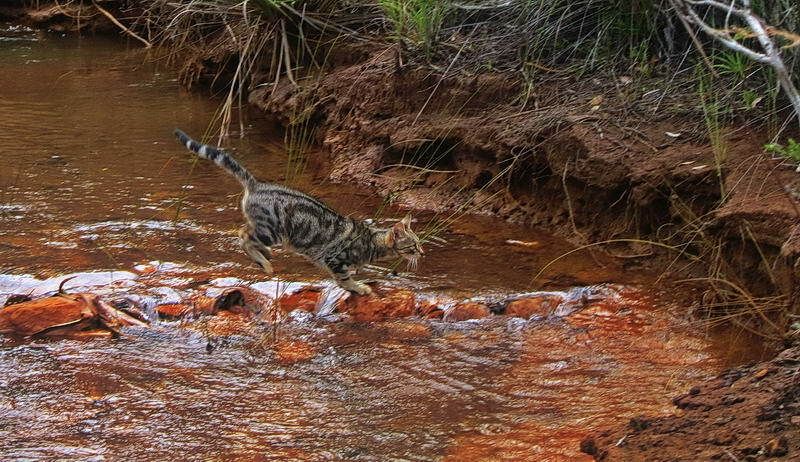 She was an active cat and went with us everywhere as we trekked on the trails taking photographs of wild flowers and rivers. By July 2017 Liane was a full grown, good looking cat. She would vanish if anyone else came by and then come out again after the strangers had passed by. 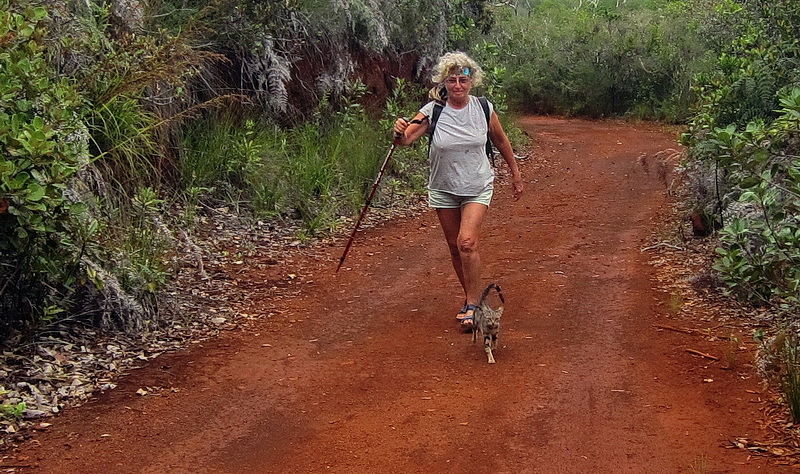 If the other trekkers had a dog, Liane would be gone for good that day. She moved like lightning if she spotted or heard a dog. Once we saw her run straight up a vertical stone cliff - like she could fly. Shortly after we first met Liane, we found the bones of a cat that we think was Liane's mother. We think she was killed by a dog. So Liane really didn't trust dogs or strangers. But she really loved us. We sailed back to Noumea for supplies every so often and would be gone for several days or a week but when we came back and came ashore Liane would be waiting for us, ready to go for another walk. Sometimes she hiked for 3 or 4 kilometers with us, along forest paths and over rivers; sometimes running ahead, hiding, and then pouncing out at us; sometimes walking beside us, talking cat talk. Liane had an amazing lexicon of sounds that, we were sure, was cat talk. Real cat talk, not the meows used on humans by house cats; more like genuine cat to cat conversation used to discuss business between cats. We could sometimes guess what she was trying to say to us but she normally had to rely on body language to make us understand when she wanted to tell us something. And then, one day, we noticed Liane was pregnant. We had to go back to Noumea to do some shipyard work on the Moira and knew we would not be back for awhile. Fortunately there was another yacht in the anchorage and the captain agreed to feed Liane at her feeding lair until we returned. When we did return we had a surprise waiting for us. Now that is an awesome story Brother Dear. I'm sure Mom and Dad were watching too. Well done brother and very well written.